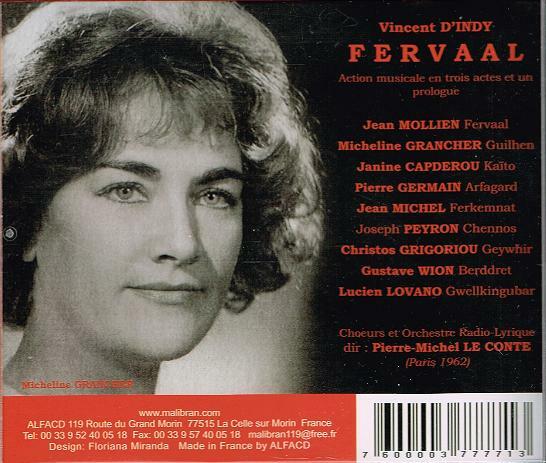 �One must admire the enterprising Malibran company for releasing that which is, to my knowledge, the first recording of Vincent d�Indy�s opera FERVAAL. This was a 1962 French Radio broadcast, and I am unaware of any prior release of this performance. (My source for Malibran, by the way, is Norbeck, Peters & Ford�www.norpete.com). Is it too churlish to complain about the lack of not only a libretto, but any notes of any kind? All Malibran gives us is a track listing, and considering the likelihood that anyone who purchases this disc will know very little about the opera, more would surely have been in order. What Malibran has given us, though, is a fine performance in very good monaural broadcast sound from the early 1960s, and the opportunity to discover a wonderful French opera very strongly influenced by Wagner. One hears hints of TANNH�USER, PARSIFAL, and TRISTAN throughout this score (composed 1889-1895), but one also hears a strong individual compositional voice as well. If your knowledge of d�Indy is limited to the �Symphony on a French Mountain Air�, the scope and weight of this work will surprise. But those who know his Second Symphony will be less taken aback. There is a fairly good synopsis on Wikipedia, and I would prefer to send interested readers there rather than take FANFARE space. I will simply state here that the story revolves around the �old� and �new� religious order, with Fervaal, the son of a Celtic king, destined to be the last advocate of the old gods, responsible for saving his homeland from invasion but having to renounce love to fulfill his duty. The �old� order is paganism, the �new� is Christianity, so as you might imagine, Fervaal fails. There are many dramatic links to PARSIFAL and LOHENGRIN in d�Indy�s opera. Do not take from this that FERVAAL is simply poor man�s Wagner. D�Indy manages to fuse the Wagnerian elements into a French whole, and to write music of great beauty and individuality. In the title role, tenor Jean Mollien is superb. He has an evenly produced, heroic sound, an urgent way of phrasing and inflecting, and he is a strong presence throughout. Micheline Grancher�s light lyric soprano has enough weight to it to match Mollien and to fill out d�Indy�s long lines. The rest of the cast is very good, with particularly strong attention to clarity of diction. Le Conte conducts with that which comes across as a deep belief in the score, keeping it moving forward but lingering where the music requires it. 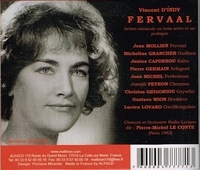 �FERVAAL is an opera in three acts with a prologue by the French composer Vincent d'Indy. The composer wrote his own libretto, based in part on the lyric poem AXEL by the Swedish author Esaias Tegn�r. D'Indy worked on the opera over the years 1889 to 1895, and the score was published in 1895. 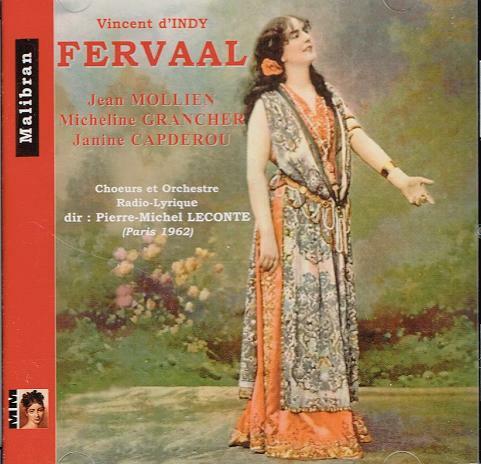 FERVAAL premiered at the Th��tre de la Monnaie in Brussels on 12 March 1897. It was subsequently produced in Paris in 1898, and again in that city in 1912. The first of 13 performances at the Th��tre National de l'Op�ra-Comique (Th��tre du Ch�telet), on 10 May 1898 was conducted by Andr� Messager and included in the cast Raunay and Imbart de la Tour from the Brussels premiere, along with Gaston Beyle, Ernest Carbonne and Andr� Gresse.